On becoming a member of a Rotary Club we join an association of 1.2 million Rotarians in 34,000 clubs doing good all over the world. This network of clubs makes up Rotary International. We are entitled to visit, and will be made welcome at, any of those clubs. Indeed we are encouraged to do so. By associating with members of other clubs the differing occupations, cultures, and countries give us a unique perspective. Our shared passion for service helps us accomplish the remarkable. Clacton Rotary Club has been twinned with the Oosterwolde and Het Westland clubs in the Netherlands, working on joint projects with them and enjoying cultural and social exchanges. Many lasting friendships have been formed as a result. Our International projects frequently benefit from the location of a local Rotary club, which may in the first instance vouch for the need of assistance and subsequently ensure that any aid or financial provision is administered effectively. It is not unusual to find a local Rotary Club forming a disaster committee to manage a worldwide Rotary response to major crises such as a tsunami or earthquake. 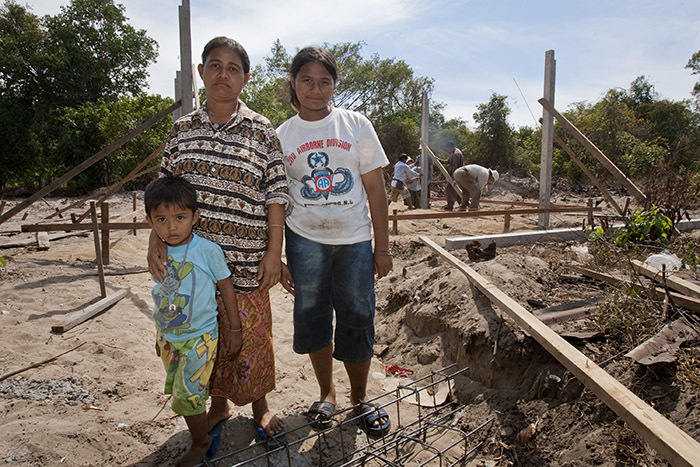 This tsunami survivor and widow, standing with her children, will receive a new home constructed by Rotarian volunteers in the Thai village of Baan Naawk Naa, on Koh Kho Khao island. Thailand was one of 13 countries and areas affected by a series of tsunamis caused by a massive earthquake on 26 December 2004 off the coast of Sumatra, Indonesia. Over 5,400 people were killed in the country, and thousands more were left homeless. Rotary clubs in Thailand and around the world provided financial assistance to construct 120 homes in the hard-hit province of Phang-Nga. Thai Rotarians coordinated a national relief effort, and The Rotary Foundation established the Solidarity in South Asia fund to assist Rotarians in supporting long-term recovery efforts in India, Indonesia, Sri Lanka, and Thailand. The fund collected nearly US$6 million, with over $500,000 going to Thailand.